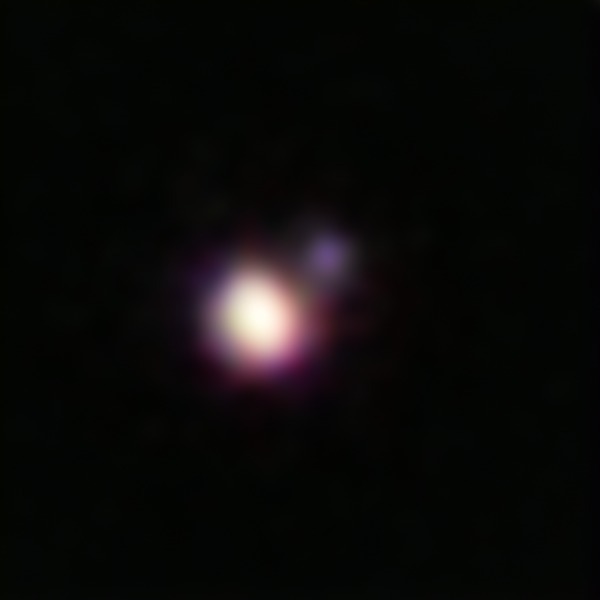 This image of the brown dwarf binary CFBDSIR 1458+10 was obtained using the Laser Guide Star (LGS) Adaptive Optics system on the Keck II Telescope in Hawaii. Taken from wikipedia.org. Good DTM seminar today by Prof. Chris Tinney, presenting a long and fascinating list of results from exoplanetary astronomy. Among many projects his group is working on at the University of New South Wales, they are observing potential planet-hosting stars for the radial velocity signals of gas giant planets in orbits with long periods, comparable to Jupiter’s period of 12 years. Such planets require long observational baselines to find because you must observe the planet-hosting star for at least one orbital period, 12 years, to conclusively say that you’ve found such a planet. As a result, there aren’t too many long-period exoplanets known. His group is also looking for brown dwarfs, exotic objects that aren’t quite stars but aren’t quite planets either. Brown dwarfs have masses large enough (probably greater than 13 times Jupiter’s mass) that they can fuse deuterium in their interiors — unlike planets — but small enough that they don’t fuse the lighter isotope, hydrogen — unlike stars.